This is another wonderful book added to my collection of sketchbook. I was pretty excited because some of my sketches are included inside. 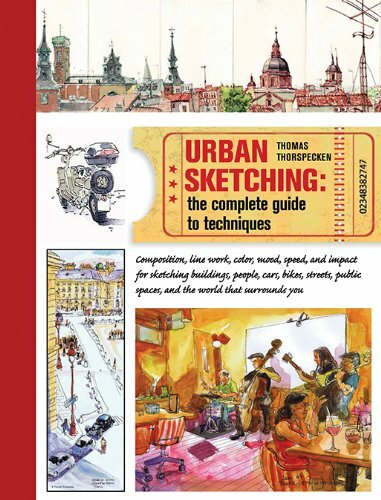 Urban Sketching: The Complete Guide to Techniques is written by Thomas Thorspecken who's also contributor the the Urban Sketchers group. He happens to have one of those draw-daily blog and you'll see many of his sketches in the book as well. This book is about urban sketching, or just sketching outdoors. It's filled with beautiful sketches, techniques and insight from more than 40 contributing artists. Every page is packed with interesting and helpful drawing tips, sketches with accompanying captions, and even the drawing process of some artists. When I submitted my sketches for the book, I did not submit any captions. So I'm rather surprised to see captions analysing my sketches, pointing out things like perspective or other hidden meanings. When people sketch, they don't really think about these concepts because they are already in the subconscious. It's great that the book has captions that explain about the fundamental drawing principles each sketch that was featured. Even though I submitted works for the book and entitled to a complimentary copy, I still bought one copy at the bookstore (because mine hasn't arrive from the publisher yet). Note that there are different publishers for the book depending on where it's being distributed. Mine's from publisher Page One (Asia) which has a different cover from publishers Barron's Educational Series and Search Press. Another book to check out would be James Richards' Freehand Drawing and Discovery. That book also covers urban sketching with tips and techniques from contributors. Highly recommended to those who like to draw, urban sketching or just want fun book to read about how people sketch. I was highly disappointed with this book. There are some techniques, but I felt it badly build up, and to strongly a mere collection of styles, with some technical comment added. 3 hours on YouTube or just this blog gives more and better defined information. In short, nice to look at, but not helpful to get started in Urban Sketching, other than having a look at what it is. I therefore gave it away within a week. Not even bordered to return it.